HEROSLAM, leading manufacturer of thread rolling tools for the fastener industry, presented their latest products at this important event and makes a very positive balance of its participation as an exhibitor at FASTENER FAIR MEXICO held in Mexico City on June 1-2, 2016, where the company had the opportunity to consolidate and increase their international business. 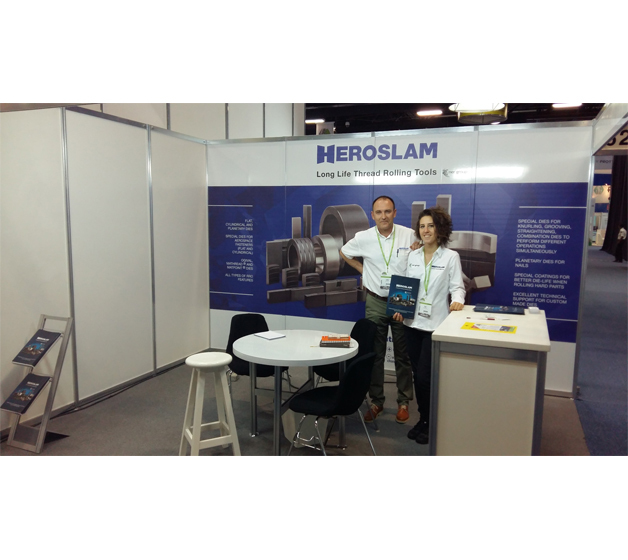 HEROSLAM presented their latest product innovations to their existing and potential customers. These new products and features have been conceived to meet the increasing quality requirements of HEROSLAM’s international customer base. Once again, and thanks to HEROSLAM’s long experience and deep know-how on state-of-the-art fastener threading technologies, the company presented important innovations such as the revolutionary GG coating, made in-house, which significantly increases tool service life when rolling parts after heat treatment, new RRO features that improve threading quality for the most demanding threading applications, as well as the new MATHREAD® line of licensed tools, and Ogival tools on which HEROSLAM is an international reference thanks to the unbeatable performance of these type of tools. The show also helped HEROSLAM consolidate their position as a reference provider within the international fastener industry. The company is proud to announce that more and more fastener manufacturers around the world rely on HEROSLAM as their preferred thread rolling tool supplier.